Long before Tai Chi and Qigong became household names in the West, an American sailor visiting Shanghai discovered a gentle Chinese exercise he called “Chinese Wand Exercises.” This exercise system is simple yet potent and involves the manipulation of a lightweight pole traditionally made of bamboo. Also known as `Jiangan – The Chinese Health Wand,’ the system co-ordinates slow diaphragmatic breathing with graduated stretching and strengthening exercises to promote circulation and stimulate the cardiovascular system. This book offers a concise practical guide to Jiangan exercises, providing detailed instructions and illustrations while also exploring the Chinese philosophy behind the art. 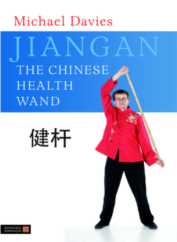 Although a gentle and meditative form of exercise, the book shows that Jiangan has the muscle-toning and weight-loss potential of more robust gym workouts and is an ideal daily exercise routine or warm-up for a range of sports and martial arts classes. Michael Davies is a senior instructor with the Tai Chi Union for Great Britain and has been practicing Chinese internal arts for over 30 years and teaching Tai Chi Chuan for 13 years. He holds workshops and seminars in Jiangan throughout the UK and Europe. He lives in Hertfordshire, UK. “We have more and more need in these frenetic times for the wisdom of Chinese medicine. Michael shows very clearly how Jiangan exercises can be used to benefit ourselves. I regularly see, in my own practice, how people’s health and vitality can be transformed by following such exercise regimes. I can wholeheartedly recommend this book for those who want to become more healthy and for those who want to maintain their health.” – Dr. Stephen Gascoigne, medical doctor, acupuncturist, herbalist, UK and Ireland.